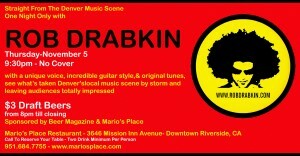 Come join us (Derek) on 11/07/2009 for a special one night event in Riverside, Ca. 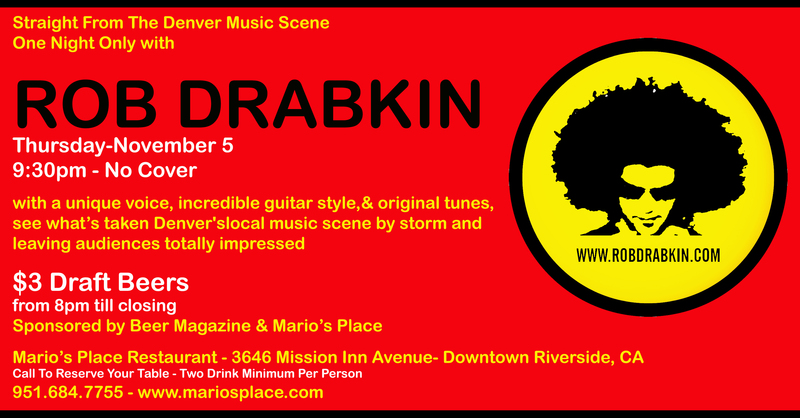 Together with Mario’s Place Restaurant we are happy to bring a special acoustic night with Denver sensation Rob Drabkin as he treats us all to his unique style of music. Since we’re a beer magazine, we are going to be giving away copies of the latest issue and we’ve set up $3 draft beers for the night. Come down and hang out if you’re local. It should be a great Thursday night.